Why free art in Barcelona? While most of the Barcelona art I write about is free, I sometimes include exceptions, and this is one. A three-euro entrance fee to see inside one of the city’s best conserved Romanesque buildings—its oldest Christian church—is worth it. The church and cloister of Sant Pau del Camp (Saint Paul in the Fields) has to be one of Barcelona’s best-kept secrets. Around the time of the founding of Barcino—Barcelona’s Roman predecessor—a Roman villa was built outside the city walls near the slopes of Montjuïc, on a wide cultivated plain known as el Camp (the field). 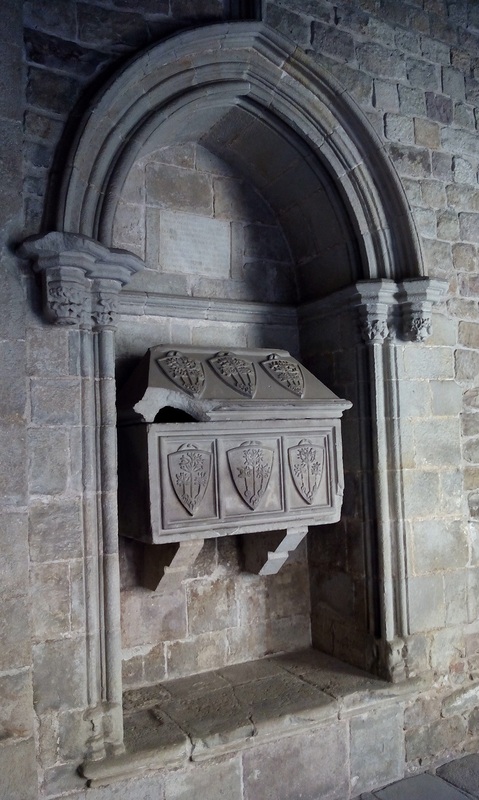 The original church was apparently founded by Count Wilfred II/Borell I, some time between 897 and 911, as attested to by his funeral stone, which is on display. Unprotected by the city walls as it was, this first building made an easy prize for marauders. When sacked in 985 by the usurper to the Cordoba caliphate Al-Mansur (Almanzor) in his push north of the Ebro River, the destruction and loss of life was total. In 1096, a Benedictine monastery was established on the rebuilt site, but the building was attacked again in 1114. 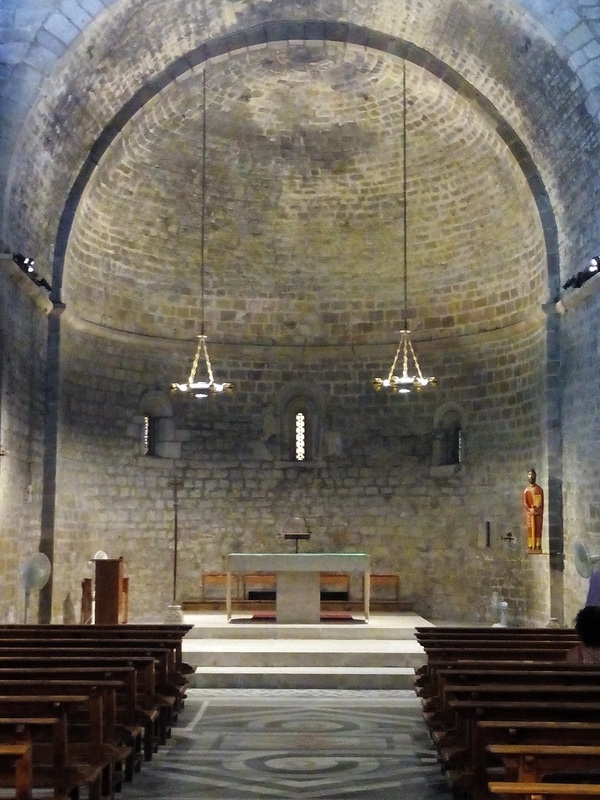 Three years later, a noble, Geribert Guitard, and his wife Rotlandis, rebuilt and raised the monastery to the status of priory, attaching it to the monastery of Sant Cugat. As a special gift, they placed the community under the protection of the Holy See, which allowed it full autonomy. However, not until the fourteenth century were the city walls expanded to protect the site. Finally, in 1835, the monks were forced to abandon the site as a consequence of the so-called Ecclesiastical Confiscations of Mendizábal when religious communities across Spain were forced to give up assets they were not developing. The building was used first as a school and then as a barracks before—with the support of “the Monserrat troubadour”, poet, journalist and politician Victor Balaguer—it was declared a national monument in 1879. 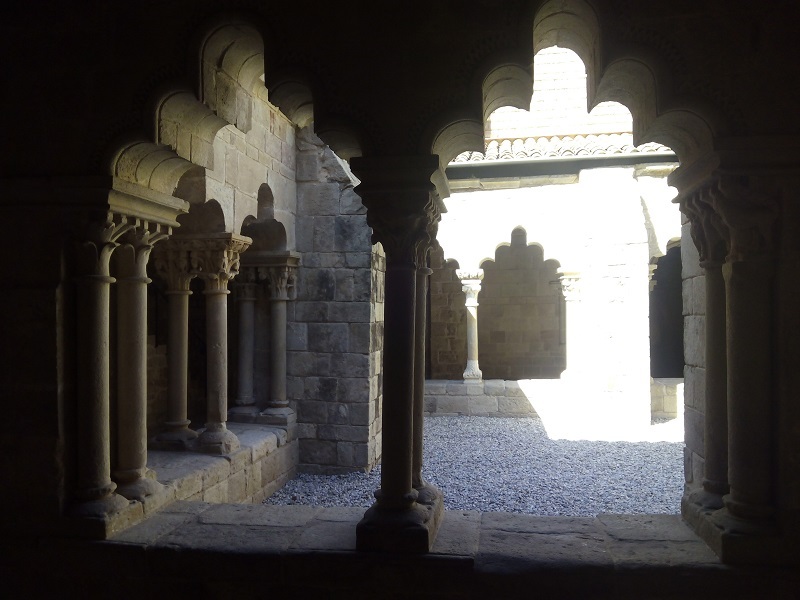 Inside, the square thirteenth-century cloister breathes a sublime calm. In comparison with the one in the Barcelona cathedral, it is relatively free of tourists. The capitals on its 48 paired Corinthian columns offer captivating details: while the majority boast the traditional acanthus leaf designs, you’ll also find Adam and Eve alongside the serpent in its tree; a woman whose breasts are being eaten by two toads; knights fighting monsters; an archer shooting a deer; and a menagerie of griffins, lions, birds of prey and mermaids. 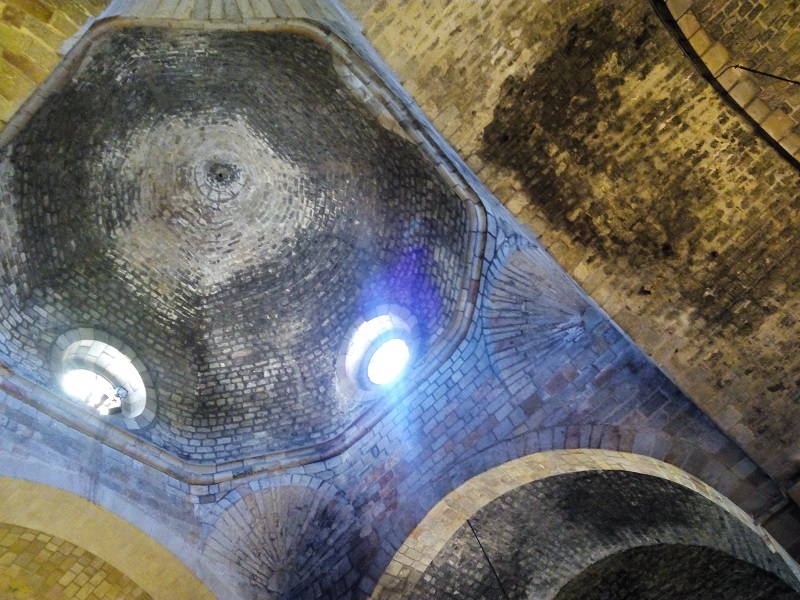 In the church, the single nave and transept arms are barrel-vaulted while the three apsides all have domed ceilings. The church’s Romanesque lines are beautifully simple and the decoration is minimal, allowing you to appreciate the architectural space without the obfuscation of overblown religious iconography. Most of the latter was burned by anarchists and revolutionaries during two periods of civil unrest: the 1909 Revolution (christened “tragic week” by the Catalan bourgeoisie) and the outbreak of the Spanish Civil War in 1936. Burn marks on the stone appear to be the result of such sackings, as the Catholic Church has been a consistent collaborator in the many dictatorships and repressive monarchies that have castigated the Spanish people on and off since feudal times. 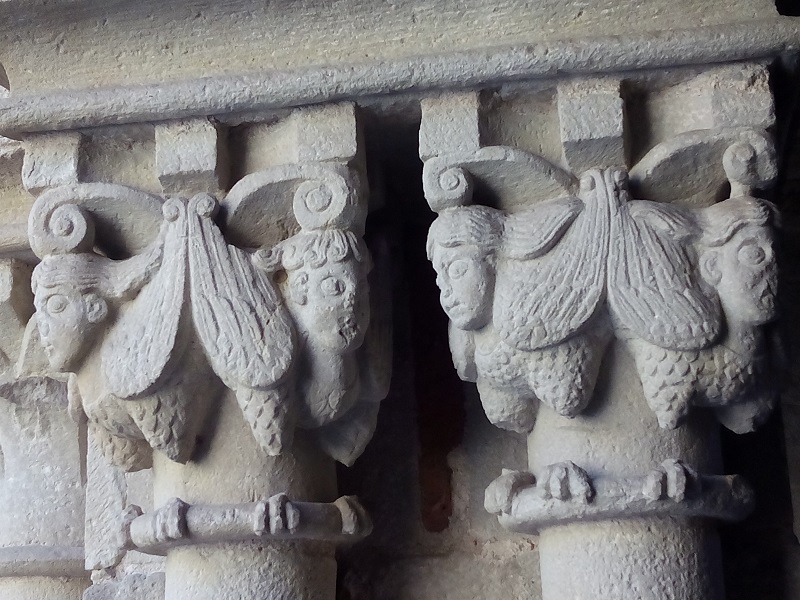 Other churches in Barcelona, such as Santa Maria del Mar and Sant Pere de les Puel·les, bear similar wounds. But whatever your perspective on such history, a visit to this church is a meditative retreat from Barcelona’s heat and hustle. Follow me to hear about new posts – I publish quite sporadically.